Happy Imbolc, lovely people, and Lá Fhéile Bhríde shona dhuit, or Happy Saint Brigid’s Day to you! It’s the full moon, the beginning of February, and the ewes are swelling with life! So am I, for that matter. It’s lovely to see the fresh bright green of chickweed and dandelion already popping up in the soil. Bulbs are beginning to poke up greens to taste the air. More and more birds are returning to the backyard – it’s been a chore keeping the feeder full, even with the increased presence of a juvenile red-tailed hawk in the backyard lately. Don’t get me wrong, it’s still quite bitterly cold and windy, but the signs are there – spring will return! Unfortunately, the Cailleach appears to be gathering wood. There’s an old tradition that says that the temperature at Imbolc tells the forecast for spring. When it is cold during Imbolc, the Cailleach, the Winter Crone, is tucked into her warm home, sleeping, and content, because spring will arrive soon. When it warms at Imbolc, it is because the Cailleach is out gathering more firewood because the cold will return and spring will be a bit later than we may wish for. Last night was quite cold, but today is going to be almost 50 degrees and sunny…ugh. Well, enjoy your wood-gathering, Grandmother, and let’s all work on staying warm as best we can! It’s easy to feel Brigid this year. 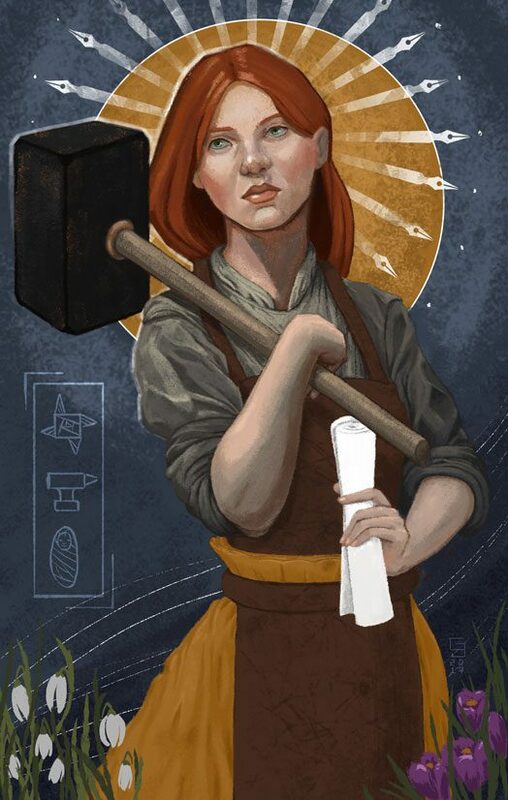 She’s the patron of fire, poetry, blacksmiths, and midwives, and I’m smack dab in the middle of this baby-making time and nesting is in full swing. I haven’t been blogging because I’ve been scrubbing, dusting, cooking, and baking up a storm! When I don’t have the energy to do those things, I’ve been binge-watching The Great British Bake-off and reading bread and baking forums. It’s rather becoming an obsession! So far, my bread experiments have been fair-to-middling in their results, but with each underproved loaf or overdone muffin, I’m getting better and learning what to do! I try not to waste things, even if they don’t turn out quite right. The chickens have been enjoying warmed porridges made from the more unpalatable mistakes and slightly underdone soda bread can be saved by being toasted in slices and is worth the eating with a slab of butter on. So far, I’ve made a few different bread loaves, the above being a braided loaf filled with nuts and chopped fruit and the other a plain french bread that I learned a lot from making. There’s an amazing number of things that can go wrong in a bread made with four ingredients! I also made a big batch of chocolate chip cookie dough, making two trays of cookies immediately and freezing the rest of the shaped dough for easy baking later on. Cookies on demand – as many as you want, whenever you want. Dreamy! You just bake them frozen, and they end up with a really nice texture and only take one or two more minutes in the oven. Just last night, I decided that I wanted to bake a cake from scratch. Eric and I are not fond of plain yellow cake due to too many disappointing times chomping into a beautiful cake only to find it dry, crumbly, bland, and covered in overly-sweet icing. I did a bit of poking around online and came across a recipe posted in 2008 on the BackyardChickens forum that sounded like the perfect cake: a blend of yellow cake and pound cake. Behold: The Perfect Yellow Cake! Three cake pans went into the oven, but since we were testing the recipe, we ate one of them plain. For science. It was quite good; rich, but not overwhelming, springy and moist but cooked through, and overall a winner in our book! After the two other cakes were cool, I assembled them with a blend of strawberry jelly and cream cheese between the layers and frosted all around with an almond buttercream icing. Another positive side effect of the baking is that it helps to keep the house warm – this winter has had some particularly chilling days so far, at least for this area of the Western North Carolina mountains. It also helps to keep the soul warm…the smell of baked goods brightens up a house and the moods contained therein with a quickness! This is normally the time of year that I tend to fall into depression, but the constant changes in my body with the growing baby have kept my moods higher than usual. The patterns of the winter shadows that I normally walk are still there – just a bit more subdued than usual, and less insistent that I follow their path. I feel very lucky, as I know several Mamas who got the other end of the hormonal lottery with their pregnancies, with increased depression and anxiety. I have found that reducing my presence on social media sites during times of stress to be very helpful, so don’t worry if I’m quiet on Facebook or Twitter – I’m just taking time for myself and my family without the eyes of the world on me! These herb scissors from the shop at The Herbal Academy are firmly on my wishlist! I would really appreciate having a small pair of scissors that will fit easily into my basket or pocket while foraging and gathering herbs. I’m saving up my pennies and dreams for a Kitchen Aid mixer, now that the baking bug has bitten me! I was pleased to learn that they also have attachments like pasta makers, slicers, sausage stuffers, and even ice-cream makers…all news to me! I’m far behind on kitchen gadgetry. Thinking of spring: I’ve been planning my spring garden, from budgeting to spreadsheets of planting dates! I have a ton of seed stock, but much of it is many years old. I’m going to get a cubic yard of potting soil delivered again this year, and Eric and I are going to build a few more raised beds. We’re going to do salad greens this year and I’ll try to keep them sown for fresh baby greens all summer-long! Potato towers, corn, squash, peas, tomatoes, habañero peppers, and scads of herbs and flowers are all on the list. Perhaps a tall order with a wee Pixie on the way, but I think we can do it! Hi! It sounds like you are going full bore nesting! Baking even. The bread is beautiful! I also did my first braided bread recently. I baked a Challah for a customer who is a single man and away from his family during Chanukah. It came out so pretty that I wanted to eat it. I have to work out a gluten-free method. We love you, too! Nesting like CRAZY, Connie, it’s so funny! I was on my knees scrubbing the floor last weekend. I haven’t tried Challah, but I adore it. That’s so sweet of you to make that for him, and must have been torture to smell and not taste!! Could you share your cookie recipe? I also live in Western North Carolina and really enjoy your blog and page.